To me, making sundaes at home is ten times more fun than heading out for a quick summertime treat. There’s just something about gathering in the kitchen with friends and loved ones, rolling up your sleeves and getting your hands dirty, so to speak. When it comes to sundae toppings, the possibilities are endless — even when you’re making pure vegetarian sundaes. You don’t need any fancy tools or ingredients to melt a handful of chocolate chips and some soy creamer together to make a delicious hot chocolate sauce, my usual go-to sauce for sundaes. But this past weekend, I decided that the extra blackberries I still had from my greenmarket excursion were begging to be turned into the perfect sweet-tart topping to lay over some Vanilla Bean non-dairy ice cream. Those blackberries paired with basil, fresh lemons, and a dash of the Blackberry and Mint Lemonade I now always have on hand in my refrigerator, resulted in a sauce that was nothing short of spectacular. Prepare the sauce: Add the blackberries, basil, sugar, water, and lemon juice (and lemonade if using) to a medium saucepan over medium heat, and reduce for 20 – 30 minutes, stirring occasionally. Be sure to keep checking and stirring to keep the mixture from burning. Once the berries have popped (you may also muddle them a little as you stir, to get them started), and the ingredients have reduced and thickened, remove the pan from the heat and set aside to cool slightly for just a few minutes — not too long, you want your sauce to be warm when you serve it over ice cream. Pour the sauce through a fine mesh sieve over a small bowl. With the back of a wooden spoon or a spatula, press the berries to strain the juices. Discard the berries, seeds and basil leaves remaining in the sieve. You should have 1/2 to 3/4 cup sauce when you’re finished. 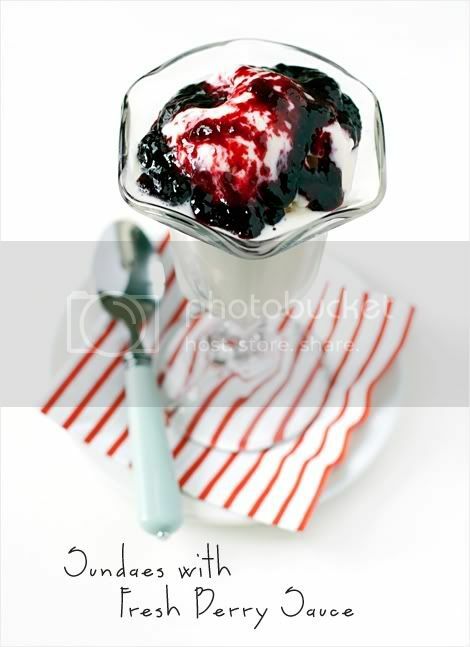 Make your sundaes: Add a spoonful of warm berry sauce to the bottom of 4 bowls, each. With a large ice cream scooper, add two scoops of ice cream to each bowl. 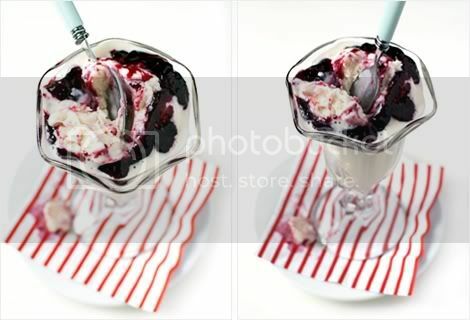 Spoon warm berry sauce over ice cream and serve immediately.